This lecture focuses on the elucidation of Submandibular Region and Floor of Mouth. In section one, Submandibular Region is discussed. The educator puts forth an overview of Submandibular Region in the beginning. Afterwards, details about the Muscles of Submandibular Region are unravelled. The prime focus of section two are the Muscles of First Plane. The educator begins by demonstrating the Digastric Muscle. Furthermore, to provide a better insight the educator highlights Anterior Belly of Digastric Muscle and Posterior Belly of Digastric Muscle. Besides this, the Nerve Supply of Muscles of First Plane is discussed. In addition to this, the elucidation of Connections of Posterior Belly of Digastric Muscle is carried out. Light is then shed on the Difference between Anterior and Posterior Belly and Stylohyoid Muscle. Section three covers the topic of Muscles of Second, Third and Fourth Plane. Firstly, the educator demonstrates Mylohyoid Muscle and Geniohyoid Muscle. Afterwards, explanation of Hyoglossus Muscle and Connections of Hyoglossus Muscle is carried out. Later, extensive information is delivered regarding Styloglossus Muscle and Genioglossus Muscle. Section four is about Glands and Digastric Triangle. The educator gives a comprehensive overview of Sublingual and Submandibular Glands. Subsequently, the Digastric Triangle is demonstrated followed by an elucidation of Floor of Digastric Triangle and Content of Digastric Triangle. In section five, the educator throws light on Floor of Mouth. A thorough overview of Floor of the Mouth is presented followed by demonstration of its Skeletal Aspects. Moreover, an insight into the Hyoid Bone is provided. Subsequently, the educator highlights Inferior Surface of Tongue and Lingual Frenum. 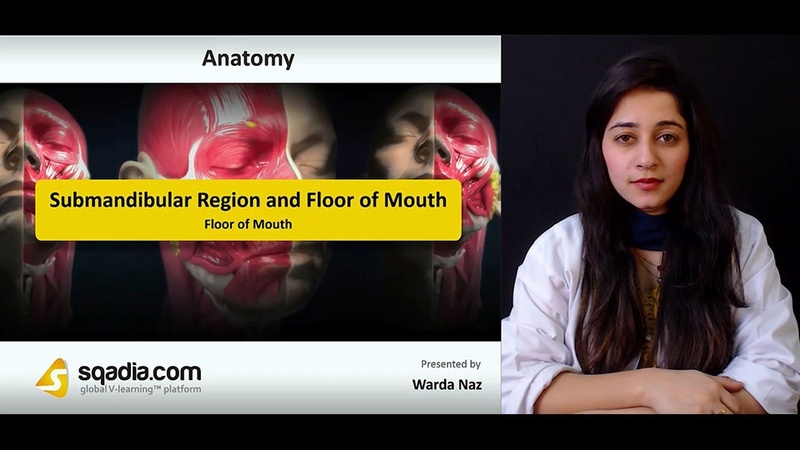 Apart from this, the Blood Supply and Nerve Supply of Floor of Mouth are also discussed.